You are here: Home / Entertainment / Visit Indy! I just love Indianapolis. The sites, the restaurants, the city activities, so many things! We try to get to Indianapolis at least twice a year… And some events are a must every time we go. We always see the Pacers play, and we always go to Traderspoint Creamery! This go around, we were actually famished as we headed toward the Skyline… Only one place to stop… Shapiro’s Deli! Have you ever been there in Indy? Just delicious. Old-fashioned cafeteria with the line you walk through with delectable food to pick and choose from and over-order… The best Reuben anywhere! Yes, it competes with New York City! We indulged… Then moved along to our hotel. This trip we stayed at the Hyatt Regency in downtown Indianapolis… It did not disappoint! We got to our room and were greeted with a wonderful welcome from the hotel. Always a yummy surprise. Great room with super comfy bed. No time to hang around though, we had to head out to the annual Pacers game. It was a great game with the Pacers in the lead the entire time. I like when they win. I’ve come to feel as though they are my home team. As we headed back to the hotel, I saw the name CharBlue on a building… hey, I know that guy! That was a yummy feast… Glad we stopped in! Now back to the hotel for a little rest. We woke up and went for a swim because this hotel has a pool! Always a plus… Especially when it’s cold outside as it was! We piled in the car (our dear friends accompanied us on this trip) and headed out to one of our favorite spots as I stated, Traderspoint Creamery. Always a special treat, especially since I have become close with the folks who run the place! I feel like we ordered everything on the menu, and we ate practically everything. Of course we had to go out back and see the cows as this is a working dairy farm, only the freshest ingredients in everything! We headed to the mall for a few hours of shopping ($$$$), Then took a bit of a drive and then back to the hotel. Had to rest before our next meal! So, we headed north to one of our all-time favorite Indy restaurants, one I haven’t mentioned before… Late Harvest Kitchen. Farm to table amazingness. Maybe 15 minutes from downtown with just the absolute best food. It was hard to decide, so yes again, we practically ordered the menu! Pork belly, whole Bronzini, rabbit (I’m sorry but it was so good! ), and the desserts. They also have an incredible wine selection and festive bar. Great atmosphere…. great food…. one of my faves. Once again, a feast and wonderful time was had by all! Thinking of escaping to Indy in May? THE INDY 500…..a must! On May 11, practice and qualifying begins. 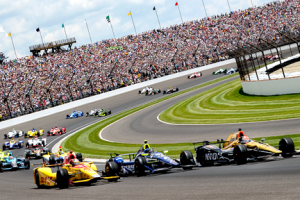 So many events for weeks to come, including the Indy Grand Prix on May 12 and weekly races, but the grand finale, the 102nd running of the Indianapolis 500 presented by Penngrade Motor Oil – Sunday, May 27, 2018. Come for the first time, or come for the 20th time! What an amazing action packed month of fun! Go to IndianapolisMotorSpeedway.com and VisitIndy.com for up to the minute planning of your awesome getaway! So much to see and do….Visit Indy.